Message: Having recently used the bus station for the 1st time I found it be an absolute and utter disgrace. Manchester aspires to be a large, vibrant, modern and cosmopolitan city but its public transport facilities are, to be frank rubbish. The train stations are dirty, dingy and pathetic for the size of city. There isn't even a local bus terminus to speak of (even Bury has a better one) and the whole mess is capped of by the decrepit, urine stinking hole that is the coach station. I arrived there but felt I didn't want to use toilet or cafe facilities as they were such a disgrace. There is little or no signage and when I wanted to ask for information the desk was (perhaps unsurprisingly) closed. Dont get me wrong. Although not actually a Mancunian (I'm from Bury, Lancashire) I still feel proud and attached to such a city on my door step. however, if Manchester wants to continue to grow, it MUST sort itself out. It is sorting itself out, but slowly. Chorlton St Bus Station is to be renovated, but work hasn't started yet. Work on a new terminal at Piccadilly Station is now underway. When you look at stations in other European cities, such as Hamburg, Lyon, Milan, the home city of the first passenger railway station in the world is... way behind. But hopefully things are about to change. Just been following your journey around the Fallowfield loop line and noticed your companion was Eddie Johnson. Before I emigrated to Perth two years ago I worked with Eddie at South Trafford College( and bought his books). I curious to know what he is doing now and I would appreciate you passing my regards on to him - I would love to hear from him. I hate to talk about the weather but it looks as thought you havn't been having such a good time - roll on spring and summer!! and here - well it's our summer and it's beautiful. Your pictures of the snow were good to look at but no thanks I've become a softie living in a place where the sun shines every day - to be fair in the winter it's only every other day. After working with Eddie at the college I delivered a lot of courses on behalf of the TEC at Salford 100 where I trained literally hundreds of people in selling/time management/promotion to enable them to develop their businesses - if any of them read this and remember me it would be good to hear from them. Regards to Manchester (everybody here assumes I'm a Man Utd fan, I've never been to a soccer match in my life ) I have been to a footy match here in Perth and after 3/4 hours you come out, shrug your shoulders and ask "so what was all that about"
I have something in common with you and Eddie - I too worked at South Trafford College from 1983 to 1991 - full time from September 88. I taught German, French and English and took a lot of evening classes. Hello Aidan, Already appreciative of your photography as you know, and using it on my website with favourable comments from viewers. Like the idea of some of your projects to be, especially "THE EWM PUB AND CAFE BAR CRAWL" - I'll be interested to see how you hold the camera steady! Thank you for your comments - When I took this photo with my old panoramic camera, I wasn't holding the camera steady, giving us this strange wobbly slice of reality. The amazing thing was I was stone cold sober when I took the photo, honest! I took the photo in the former Bar Coast, now renamed '10' on Mary St, next to Kendals. I WAS CHRISTENED AT ST PETERS IN BLOSSOM ST , I WENT TO GEORGE LEIGH ST SCHOOL THEN TO BIRLEY ST IN BESWICK. I SERVED MY APPRENTICESHIP AS A SHIRT CUTTER AT HENRY BANNERMANS, IN WHAT I NOW KNOW TO BE JOHNSONS OLD WIREWORKS IN LOMAX ST. IN LATER YEARS I LEASED THE GROUND FLOOR OF THE BROWNSFIELD MILL ON GREAT ANCOATS ST (FACING VOLMAX!) IT MAY INTEREST YOU TO KNOW THAT A V ROE BUILT HIS FIRST AIRCRAFT THERE,THEN HE FLOATED IT UP THE ROCHDALE CANAL ON A RAFT TO MOSTON WHERE HE FLEW IT! OF GREATER INTEREST, MY RENT AT THE MILL WAS COLLECTED BY A TALL MAN I KNEW AS BOB, IT WASNT TILL YEARS LATER I LEARNED HIS FULL NAME R.S.LOWRY!! I didn't know the story about the aircraft - very interesting. This is a view of a beautiful old warehouse building just behind the wireworks - which was burnt down and demolished last year. Only the chimney still remains. Is this scene familiar to you? Westhoughton is technically in Greater Manchester /Bolton but many people really of course think of it as just itself: KEYED country. Passports are stamped on the borders and even us recent inhabitants do not belong to Wigan or Manchester or even Lancashire : we're just US. (P I am still Jean Vann just a new addy. A thousand apologies for my mistake! But what difference does it make, Westhoughton is, as you say, Westhoughton! I must also apologise that my coverage to the north west of Manchester is less than what I would like - Unfortunately, Greater Manchester is a very big area for just one person and his camera to photograph! I intend to return to that area very soon. 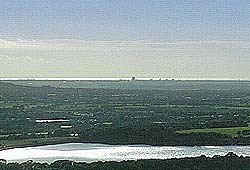 Here's a view from Winter Hill looking north west towards Southport and the Irish Sea. 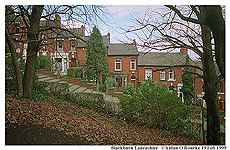 I was born in Blackburn in 1952 - where my father came from, who married a lass from Manchester. We moved to Bedford St Hulme in 1953. Went to school in Lloyd St.(Can't remember the name of the school). 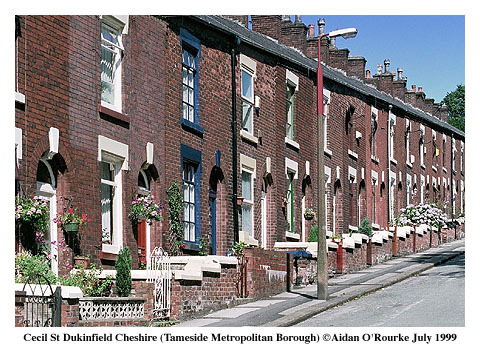 In 1962 the council decided to demolish terraced houses in the area to make way for high-rise flats. 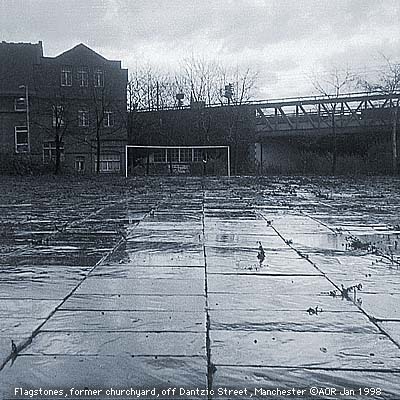 I dont recognise Hulme any more. 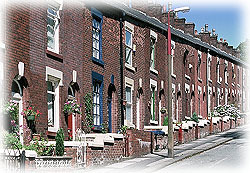 We moved to Heywood Greater Manchester in 1962. We migrated to Australia in 1966. 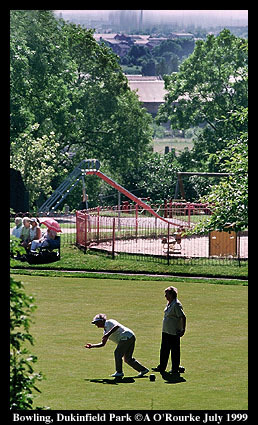 This photograph was taken when on holiday in the UK. Thanks for the photograph of Piccadilly (left), taken around 1986. It's actually two of Graham's photographs which I've merged together into one. We are looking towards Oldham Street from the top of Mosley Street. 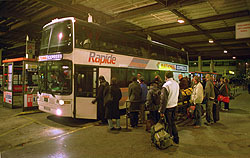 The buses are in the colours of GM Buses, subsequently bought up by Stagecoach, First Bus and other companies. 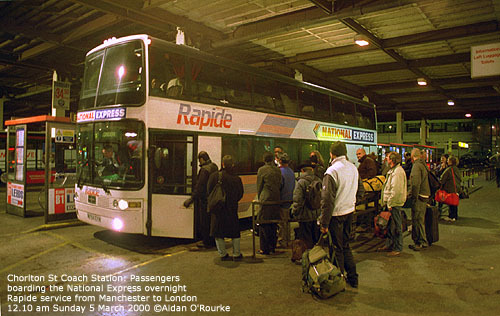 The green and white bus belongs to Walls, which was later taken over by Stagecoach. On the right is the statue of Sir Robert Peel, put up on this spot in the 1850's. 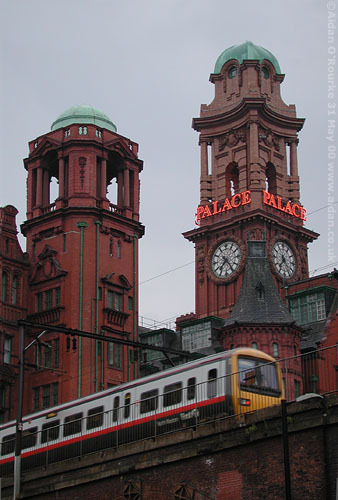 It is to be removed under Manchester City Council's 1999 Piccadilly redevelopment plan. I'll be publishing more of Graham Johnson's photographs of Piccadilly in future updates. Above left is a photo I took in Blackburn. 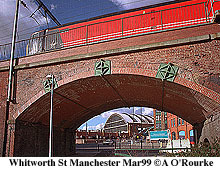 You're right, this is a very long viaduct, forming a u-shape to the south of Manchester city centre. 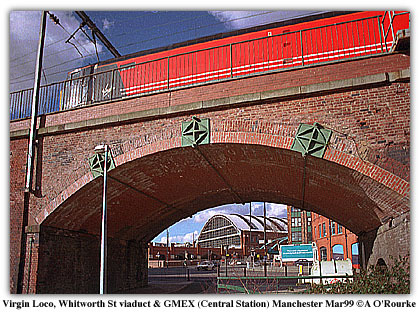 Viaducts proved necessary to carry trains into the city as, in relation to areas to the north and south, Manchester is situated on lower ground. I think the reason why the viaduct you mention can't be considered as one single viaduct is because it was constructed at different times. 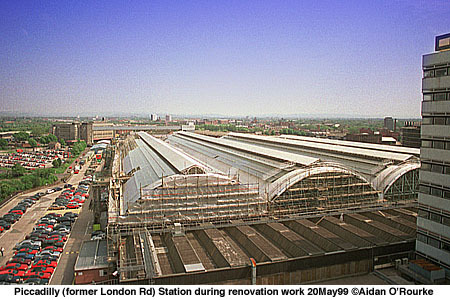 The first to be built - in 1842 - was the one from London Rd Station (now Piccadilly) towards Stockport. 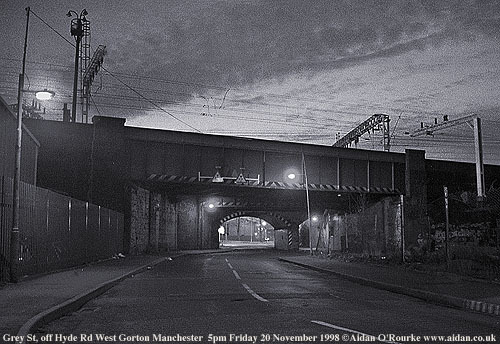 The viaduct to Oxford Rd, Knott Mill (now Deansgate) and Altrincham was added later. These viaducts are remarkable feats of Victorian engineering, and are still doing sterling service today, while motorway bridges put up the 1970's are having to be strengthened or rebuilt. 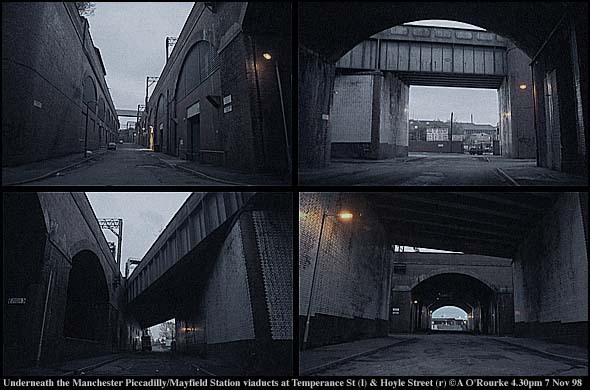 The pictures on the left show 1) the railway viaduct next to Whitworth St, 2) the viaduct next to the Refuge Building (now the Palace Hotel) 3) The view under the Piccadilly/Mayfield station viaducts 4) The bridge over Grey St, linking Longsight and West Gorton. Enjoyed your article on cinemas, it reminded me of a few I used to take my dates. Here are a few others that I often what happened to them. The Scala ,Next to the White Lion in Withington, the Lido in Burnage,half way between the Kingsway and Galleon on the Kingsway.The Rusholme Cinema,near Platt Fields and the Trocadero which was further along towards Moss Side.Finally the Palatine Cinema,south along Palatine Rd. corner of Lapwing Lane (I think! )Some of those Cinemas had the back row as double seats...those were the days. Incidently sent my sister, in Califonia ,your Web site and she is now hooked. 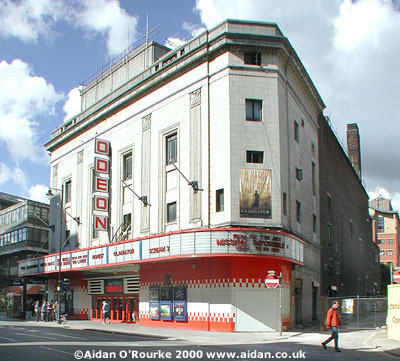 All of the cinemas you mention have disappeared, with the exception of the Scala, Withington, which is now Cine City and still going strong under new ownership. I saw a film there as part of the Manchester International Film Festival earlier this year. Sorry I don't have a photo to hand at present - I've included one of the Odeon, one of Manchester's original 1930's picture houses and still going strong. Sadly the Tatton Cinema Gatley closed recently, in response to the new cinema complex which will be opening shortly at Parrs Wood. 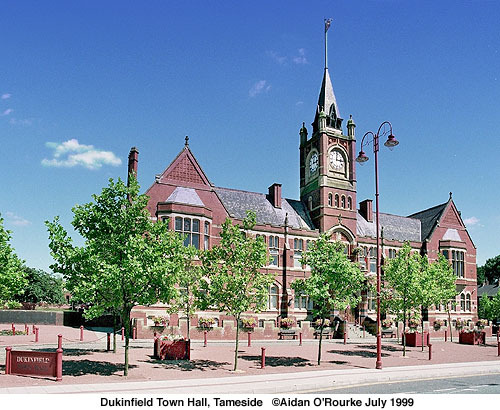 Hello Aidan, I really enjoyed the photographs and descriptions of my old home town of Dukinfield on the Eyewitness in Manchester web site. However, I have a quite different interpretation of its name. I was told it is from a Norse name "Doken Fjeld" meaning field of the raven. Apparently there was a big battle there in the 8th or 9th Century. The Norse emblem was a raven. I know of at least one business that was called Ravensfield when I lived there in the fifties and sixties. There is some interesting history about a tunnel that runs from Hall Green (near the cemetery) and the old Manor House (now demolished) down to the Old Hall Church near Globe Square. It is said that people escaped from Cromell's army by hiding in there. Also, I wonder if the old cobblestone Roman Road still runs by the Golf Club or has it been paved over, perhaps by Yew Tree Lane. I don't know - the fascninating thing about place names is that there are often several explanations - all seem plausible but none can be verified, as the evidence is lost in the mists of time. I don't know if the Roman Road has been paved over - can anyone help? Just an encouragement to do the feature on Salford & Eccles. you got so many planned features I thought I'd better make sure mine were towards the top of the list ! OK, your request has been noted! When I saw the picture and text relating to 'flags' it took me back over 50 years to when the front door step was regularly rubbed down with a 'flag stone'. My mother would get a choice of a white or a beige stone in exchange for any old clothes she gave to this little old man on a horse and cart. I can hear her saying - 'go out the back door, I've just done the flags' and God help you if your footprint was recorded on the surface! I was often chased round the back yard by my mother wielding a bamboo carpet beater and screaming 'I'll murder you if I get my hands on you'. Episodes such as this were quite a regular occurence and probably accounts for the fact that I have one slightly flattened buttock. She could move pretty smartly when she had the objective of her ire at arms length. At school I was quite a good hurdler and on reflection I put this down to the life or death training I had at home ! I remember one day when someone had lifted out the grating in the street and a horse got it's leg stuck and had to be destroyed. All the kids were ushered off the street while all the fathers had a council of war. Your reminiscences of childhood remind me very much of the writings of local history author William K Jones, originally from Manchester, but resident in Luton. May I take this opportunity to showcase William K Jones' collection of stories 'On Looking Back' in which he vividly recreates Manchester of the first decade of the 20th century when his mother was a child,. These tableaux are juxtaposed with his own boyhood memories from thirty years later. Bill has presented this and three other books (as yet unpublished) on the website www.manchester-stories.co.uk. I'm proud to say I helped with this project, providing photographs, designing book covers (left) and giving advice on web design. 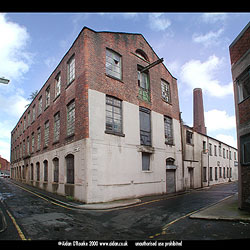 Please go to www.manchester-stories.co.uk and have a read - I'm sure you'll find it as fascinating as I did.